With certain game fish, such as wahoo, kingfish and tuna, a blazing fast retrieve is required, and Shimano's Speedmaster IV Reel with its blazing fast 6:1 gear ratio fills the bill. The Speedmaster IV is extremely castable due to its star drag system which disengages the spool from the drag. This no-nonsense Speedmaster IV Reel also features a one-piece graphite frame and sideplates, aluminum spool, stainless steel main and pinion gears, powerful titanium drag system and audible clicker. "What a great bang for the buck. 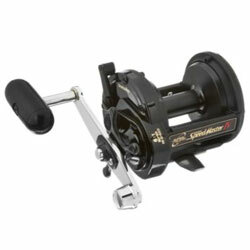 Dont waste your hard earned cash on some 400.00 over rated reel. This reel is set up on a 7' Star rod has already seen its share of Kings and Muttons. " "Drift fishing is an economical way to enjoy fishing, eating some of the most delishous fare from the ocean,and saving gas. However you often end up with lots of line out. The high speed of my Shimano is just the ticket!. Thank you for the courtious and prompt service." "Thats right, it's been over 15 years since Shimano introduced the Speedmaster to the UK market & I bought two of them the day they came available to the public back in 1990/1991. Now I live in a lovely fishing town in Southern Oregon, my two speedmasters get constant use as they 'came across the pond' with me along with my Shimano rods & bigger reels."